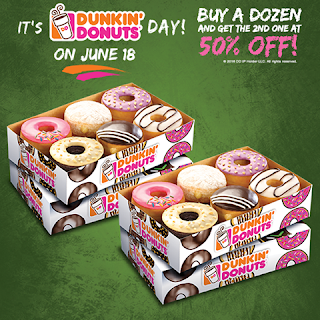 It is Dunkin Donuts Day on June 18 and Dunkin is giving away FREE donuts at participating outlets from 2-3PM. Aside from that, when you buy a dozen donuts, get the second dozen at 50% off! Isn't that a sweet treat? To make it more exciting, get the chance to see Dunkin Donuts' ambassadors Derek Ramsay, Kakai Bautista, and Jennylyn Mercado at selected outlets nationwide. So be sure to save the date and spread the word! See you there!